Vintage photo of a witch, public domain image. Sixteenth-century Scotland was a tempestuous place. The Protestant Reformation was fresh, and it appeared to be under constant threat. Religion and monarchy were intertwined. 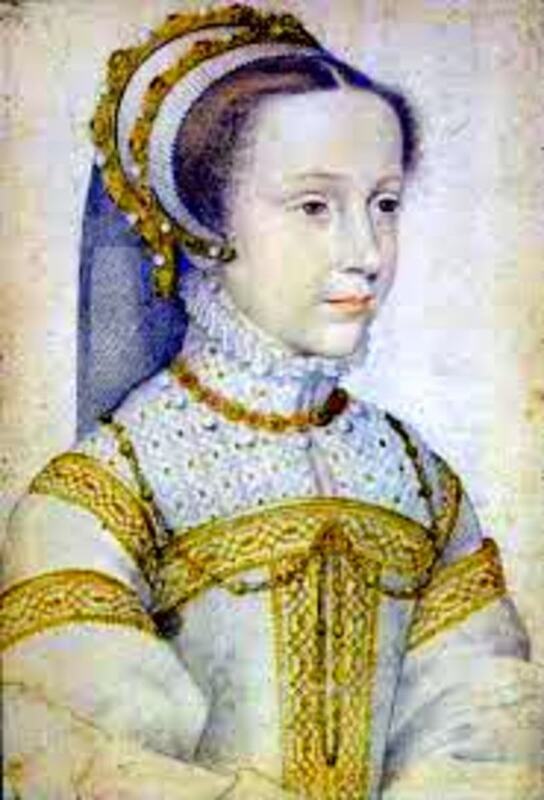 Mary, Queen of Scots had returned to her homeland to find the government had initiated the Reform without her consent. She worked out a compromise which allowed her and her retinue to practice the Catholic Mass, while it remained illegal in the rest of Scotland. 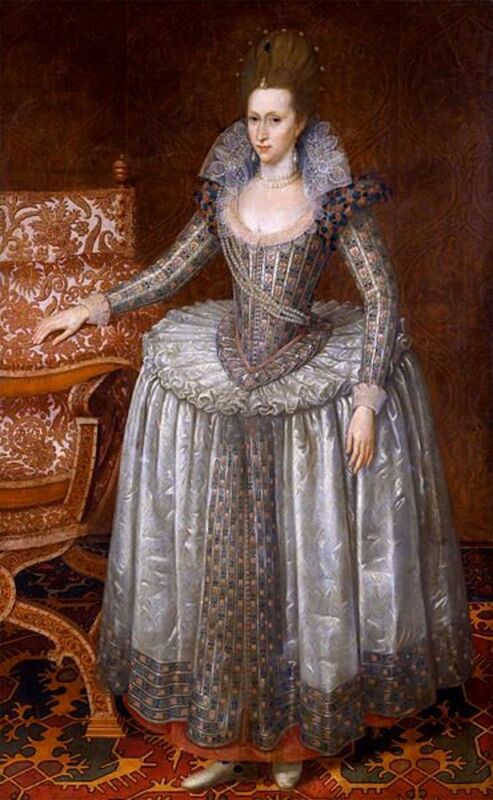 Most of us know her eventual sad fate, to be captured and imprisoned by her own people, only to escape to the realm of her cousin, Elizabeth I in England, where she was imprisoned again. 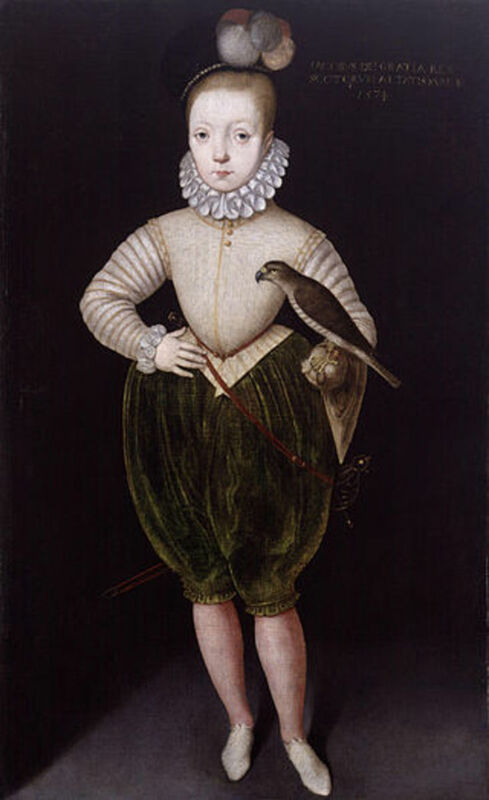 King James VI of Scotland as a young boy. 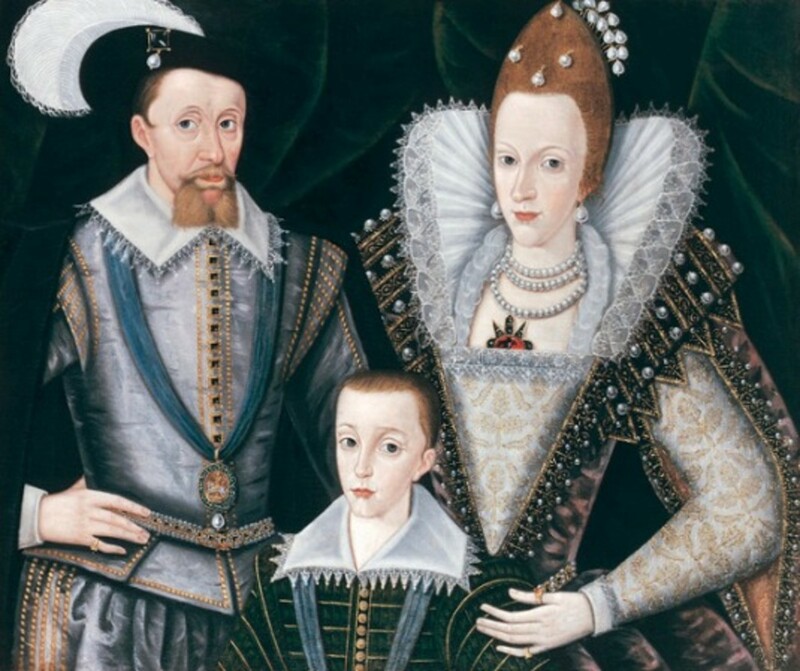 Due to these circumstances, Queen Mary was forced to abdicate her throne to her son, James VI, who was just thirteen months of age. Mary had hoped that her separation from her son would be temporary and that Elizabeth would come to her aid to restore her to her throne. How could she have known that her cousin would become her jailor, and eventually sign her death warrant? 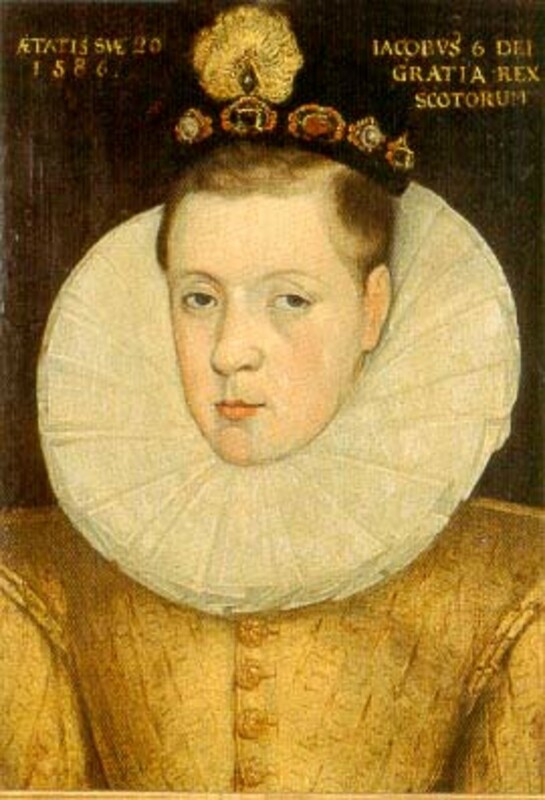 Young King James VI of Scotland, later to become James I of England, was left essentially orphaned. His father, Henry Stuart, Lord Darnley, had been killed in a plot that Queen Mary may or may not have been involved in prior to her imprisonment. He was raised by people hungry for both secular and religious control in a strict Protestant mindset. A series of regents ruled Scotland until James came of age. Many of these men were killed or died under dubious circumstances. Protestants had plotted against his own Catholic mother. And Catholic plotters would eventually plan the famous Gunpowder Plot against himself, which infamously brought Guy Fawkes into the history books. An attempt on his own life in his young adulthood got so close that he himself wrestled the would-be assassin in his royal chamber, pinning him down while calling for the guards. Under these circumstances, fearing plots on your life is not paranoia – it’s reality. 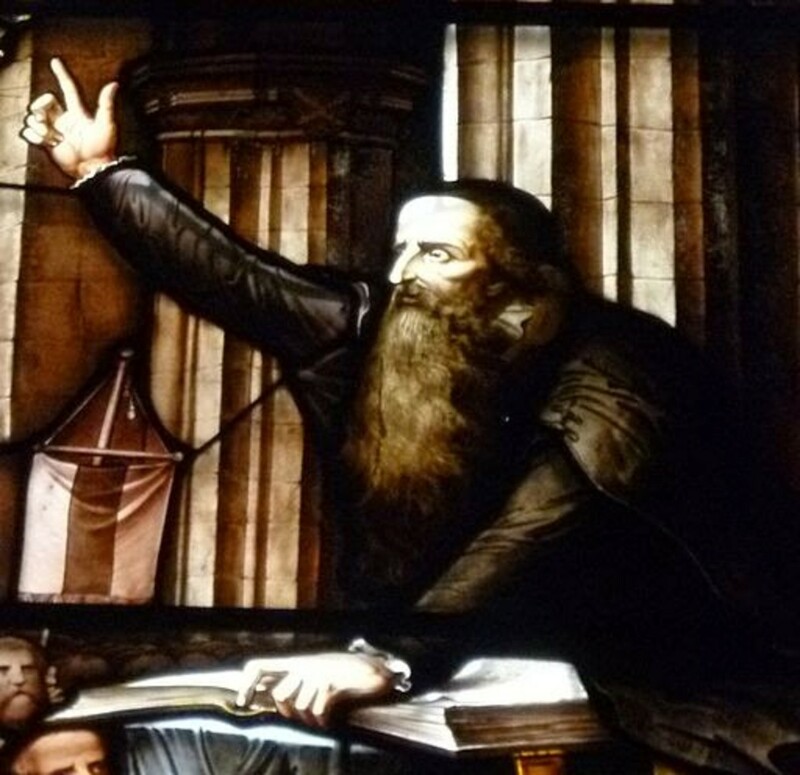 John Knox, Protestant reformer, preaching a sermon. Image from a stained glass window. It is also important to note that the Protestant Reformation brought about a change in the way witchcraft was viewed in Europe. 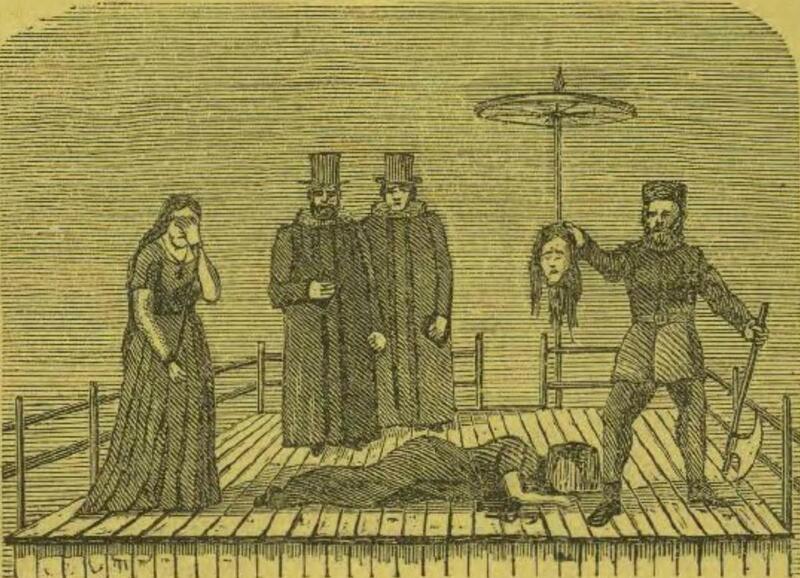 The Catholic Church wasn’t in the business of rooting out witches. In fact, the official stance of the Catholic Church was to deny that witchcraft existed. Not that people weren’t practicing it, but the Church viewed it as a silly superstition and insisted that there was no power in it. The Roman Catholic Church did punish heresy against the Church during the Inquisition, and heresy could be construed with witchcraft, but not always. And, the Catholic Church had been tolerant of local festivals and allowed local deities to be modified into the Cult of the Saints, which enabled folk customs and beliefs to continue to some degree. The Reformation ushered in a new brand of severe and intolerant thinking. 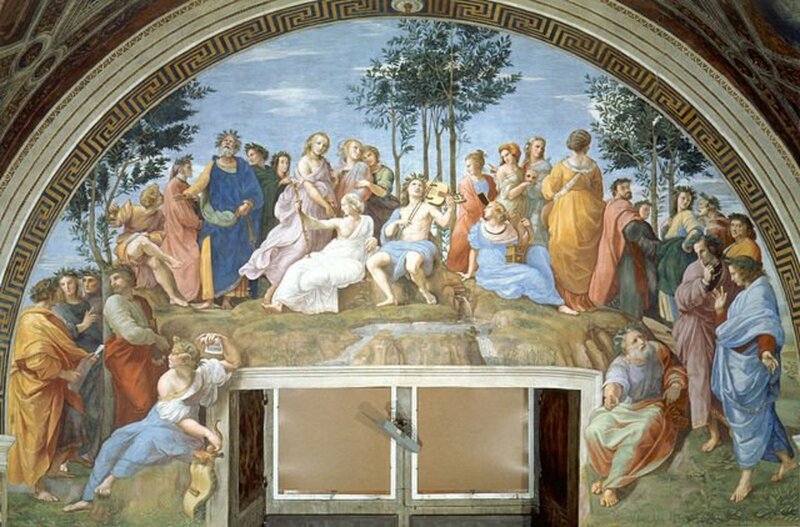 The Catholic Church was labeled as idolatrous and pagan. A new dichotomy of viewing the world through a dualistic lens of good and evil was preached. Satan and his demons were everywhere, and their mission was to take down the good Christians through the work of his soldiers, namely the witches. So, here we have a king separated from his mother at a very young age, raised in the midst of plots, murder, and subterfuge, in this tense religious climate. 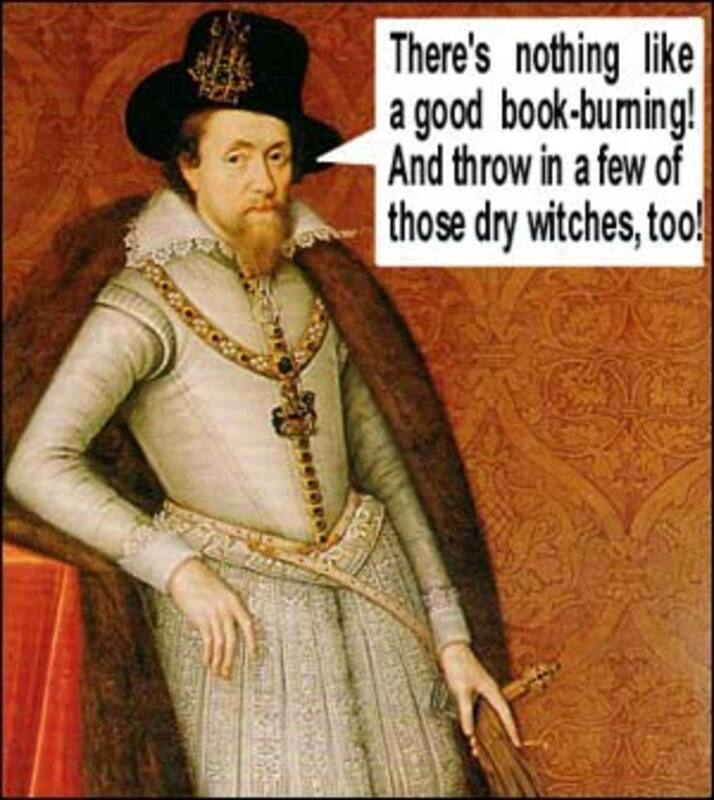 What else do we know about James VI? He was considered an intellectual. He had a sharp mind and took a keen interest in many subjects. It seems that his interest could often border on obsession. For example, it was said at one point that he loved hunting and would become obsessed with taking down certain stags, to the point of neglecting important business of the crown. James VI of Scotland aged 20, 1586. Three years before he sailed to Denmark. He was eventually betrothed to Anne of Denmark, which was a political arrangement, Anne being the King of Denmark’s sister. Although most royal marriages were arranged for political reasons, in the best case scenario the couple would grow fond of each other, perhaps even fall in love with each other. But history tells us that this was not the case for James VI of Scotland and Anne of Denmark. Apparently, their relationship was to remain aloof. James seemed to prefer the company of men. Indeed, he was known for enjoying time spent in what we might call today a “man cave,” playing cards and bantering with his male friends. There have been suggestions that his affections for men went beyond the platonic. How much these attributes and influences affected James' beliefs and actions regarding witchcraft, we can only guess. The Reformation and severe Protestant preachers like John Knox most certainly influenced his world view. Did his lack of an immediate family make it difficult for him to be emotionally available to his wife, or make him into a hard person lacking in humane compassion? Did his lack of a strong female presence cause him to mistrust women? Did his obsessive personality trigger from psychological issues? These are questions we can never know the answer to. But we do know precisely when his obsession with witchcraft began. 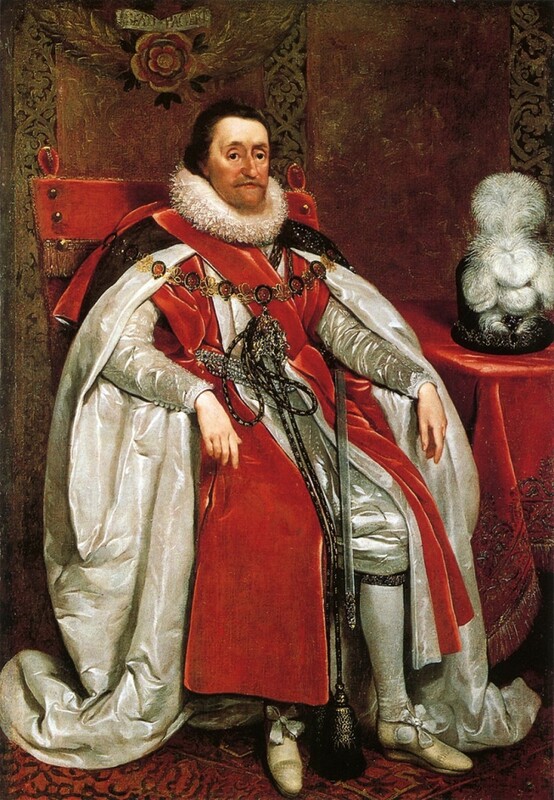 In 1589, King James VI sailed to Denmark to retrieve his betrothed. Anne was supposed to sail to Scotland alone, but her ship was forced to turn back due to storms, so James made the gallant effort of setting sail to fetch her. The Germanic countries were another Reformation hotbed, and witch-hunting was in full swing in Denmark. Both Protestantism and witch-hunting were adopted with gusto in this region. 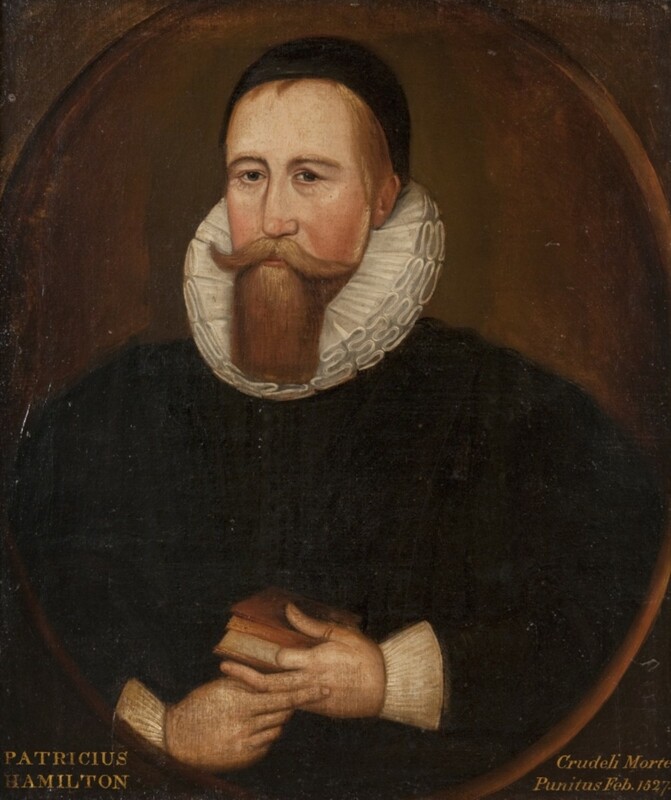 It is known that King James met with Niels Hemmingsen, a Danish Lutheran theologian and expert on demonology. Hemmingsen had written a book on the topic in 1575. So while we can’t say for certain what the two discussed, it has been speculated that James adopted the notion of “the satanic pact” from Hemmingsen. This is the idea that witches make a deal with a devil in return for power, a key belief of witch-hunters at the time (but one that is not believed by modern scholars to have had any reality in the actual practices of the accused). James was fascinated by what he learned in Denmark. He must have felt that his eyes were opened to a whole new world of evil existing right under his nose all along. Always eager to learn new subjects, James apparently absorbed this knowledge hungrily. 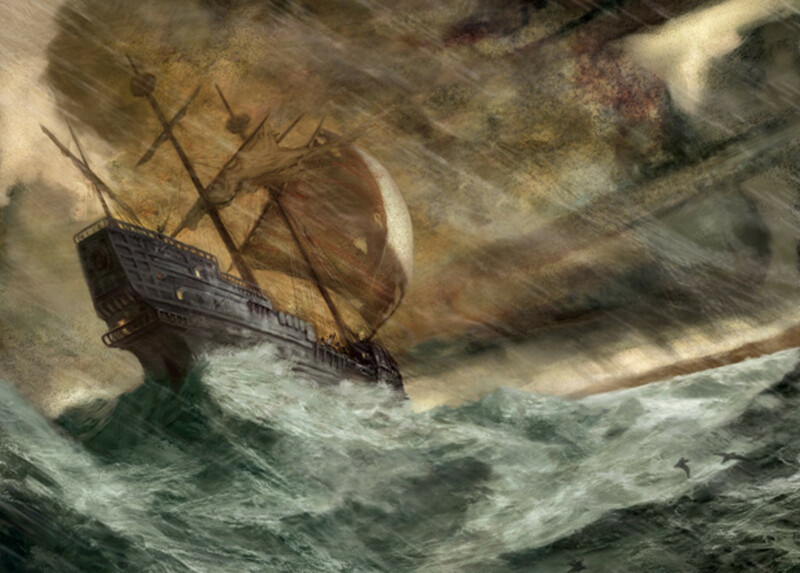 Upon the return voyage to Scotland, the King’s entourage was beset by a terrible storm. 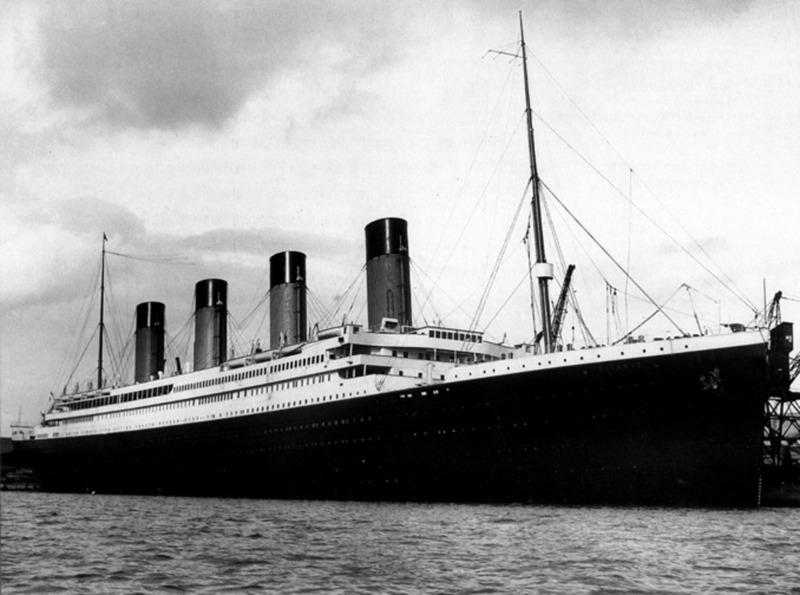 The tempest caused the ship to turn back and dock in Norway to wait it out. Because the company carried royal personages, they were escorted by the Danish royal navy. It seemed to those involved that the ship carrying the King was jostled more so than the others. The admiral in charge of the Danish fleet was insistent that witchcraft was the cause. And, due to James’ recent education about the dangers of witchcraft, he suspected it to be true. Witches in both Scotland and Denmark were suspected, and witch hunts were launched in both countries. Coincidentally, a peasant woman by the name of Geillis Duncan had just been accused of witchcraft by her employer, David Seton, when it became known that she had been curing illness with seemingly magical methods. Seton was sure the devil was at work. Her interrogation elicited the names of other witches supposedly in cohort with Ms. Duncan, who were also interrogated. The confessions became more and more grandiose until they finally revealed that this supposed coven had conspired to poison and murder the King. This confession combined with the King’s Denmark disaster culminated in the launch of the North Berwick Witch Trials. Being a man with a strong curiosity, James was personally involved with the witch trials, which was unusual for a monarch. More than one hundred people were arrested and accused. King James took part in some of the interrogations. Many of the accused confessed under torture to such deeds as what is called “the obscene kiss,” the act of kissing Satan on his posterior when swearing allegiance to him. As an aside, acts like this in the confessions are one way that some scholars are now differentiating between people who were accused willy-nilly versus people who were actually using ancient pre-Christian shamanistic practices. Those who really were engaging in real pagan sorcery were a tiny minority, and it is only recently that scholars such as Emma Wilby and Carlo Ginzburg have brought validity to this theory. But those confessions bear little resemblance to the vast majority, which seem clearly built around the expectations of the witch interrogators. In other words, the interrogators asked leading questions involving the information found in witch-hunting manuals, like the Malleus Maleficarum, first published in 1487, such as “when did you first make a pact with the devil?” Eventually, the accused would answer whatever the accusers wanted to hear to make the torture stop. Acts such as kissing the devil on his derrière are found nowhere in the few records which do seem to demonstrate true shamanic practice (more on this in future articles). 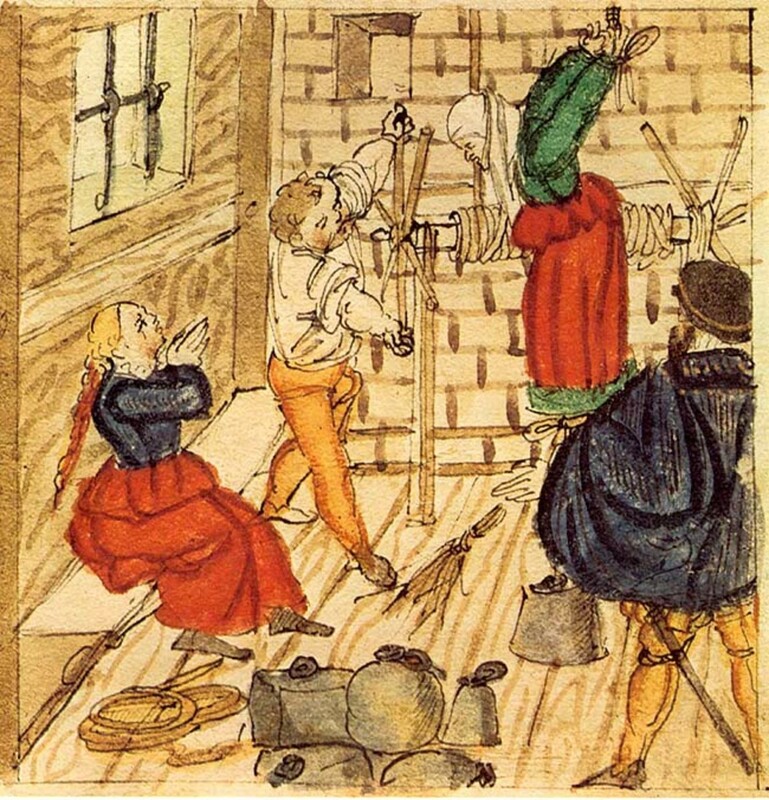 The North Berwick confessions fit squarely within the parameters of what the witch manuals outlined, indicating that the confessions were led by the accusers under the duress of torture, or sometimes methods that were not considered torture such as sleep deprivation (which can produce hallucinations). 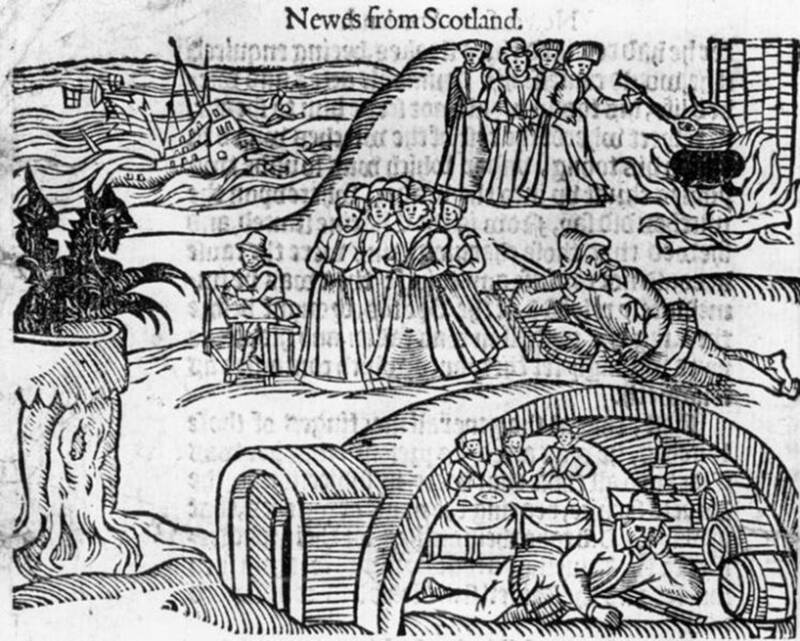 The trials revealed a massive plot whereby large numbers of witches traveled to North Berwick to meet at night inside a church. Their meetings were presided over by the Devil himself, and King James VI was described as the Devil’s greatest enemy in all the world. The witches supposedly began their plot with the use of weather magic, first to stall Anne’s departure, then to disrupt James’s return. Ms. Duncan confessed to meeting with a Danish witch to form their plot. It is telling that witch hunts had already been underway in Denmark by this time. And, the Scots did not initially blame the storms on witchcraft until they realized that the Danes did. The accused also confessed to using “image magic” and plotting to use toad poison on the King. Image magic was the act of causing harm to someone by manipulating a small image of them, similar to what we know of today as “voodoo dolls.” And toad poison was retrieved by hanging toads upside down to collect the poison from their skin. These confessions seemed so fantastical that James did not initially believe them. That is, until one of the accused, Agnes Sampson, was placed before him. When he professed skepticism, apparently Ms. Sampson asked James to come close so she could whisper something in his ear. She revealed private details about James’s and Anne’s wedding night that should have been impossible for her to know. That tipped the scales and from that point on, James was an avid believer in witchcraft. It should be noted that royal wedding nights were not private events during this period. The consummation of the royal marriage bed was, in fact, a public event observed by important personages at court. Because so much hinged on a royal union, witnesses were important. And in an age before media celebrity, who did people gossip about? The royals. So it is not outside the realm of possibility that peasants would have heard some salacious gossip about the King’s wedding night. But, why Sampson would use this information against herself is very perplexing. Perhaps it was just another example of giving them what they want to end the ordeal once and for all. James VI of Scotland, who became James I of England, near the end of his reign. In any case, this experience left James an affirmed believer in the dark forces of the occult, which in turn had a profound impact on his nation. Scotland would become one of the worst perpetrators of witch-hunting, accusing and killing a higher proportion per capita of its own population than most of its European neighbors. The North Berwick Witch trials affected James so personally, that he would write his own treatise on the dark arts not long after. His book, Daemonologie, was written in 1597, and it was the first exposé on witchcraft penned in the English language. Just as the Malleus Maleficarum before it, James’ Daemonlogie became a key tool in the witch-hunter’s kit, and was used extensively in both Scottish and English witch trials to follow. Ankarloo, Bengt, and Stuart Clark. Witchcraft and Magic in Europe: The Period of the Witch Trials. Philadelphia: University of Pennsylvania Press, 2002. Print. Burns, William E. Witch Hunts in Europe and America: An Encyclopedia. Westport, CT: Greenwood Press, 2003. Print. Lynch, Michael, ed. Oxford Companion to Scottish History. New York: Oxford University Press, 2011. Print. 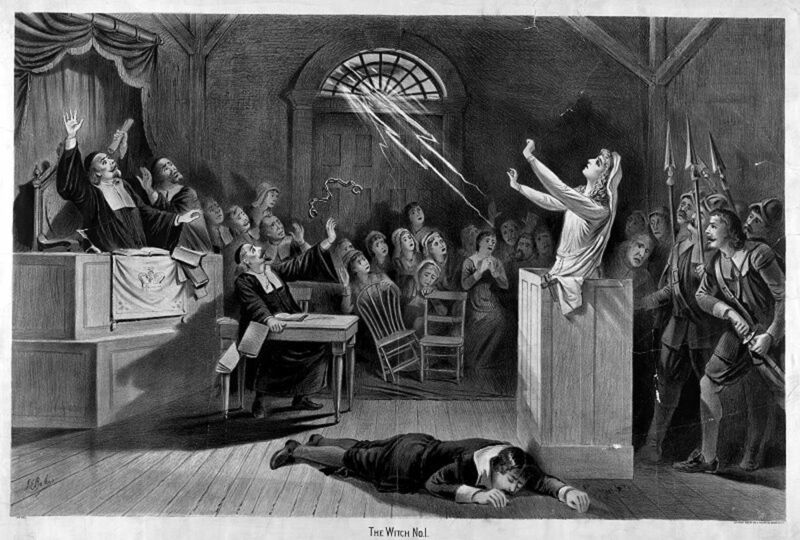 The Salem Witchhunts: A History of Witches, Trials, and Witch Hunts! Very interesting article overall - enjoyed learning a little more history about some of my ancestors. This is an extremely well-researched and written piece. Your idea of notions of witchcraft during this time period is well-organized. Your development is thorough and interesting. Excellent overall piece on such an interesting topic. Great hub Carolyn. This was a fascinating read and interesting to know. Voted up! I did not know much about King James, so I appreciate leaning more. Thanks for an interesting history of King James and witch-hunting. Amazing how enlightened those times were in some ways and how barbaric in others. Thank you Lady Guinevere! I tried to be fair to him and tell the truth without sugar coat or demonizing him. Most excellent hub of truth and knowledge that I have seen. I am sharing this one. Not one person that loves that King James Version truly undertands what he was all about. I was surprised at the things about the Original Catholic Church and what the refomation was all about with them. Again, most excellent. Hi Brian, thanks for the comment. 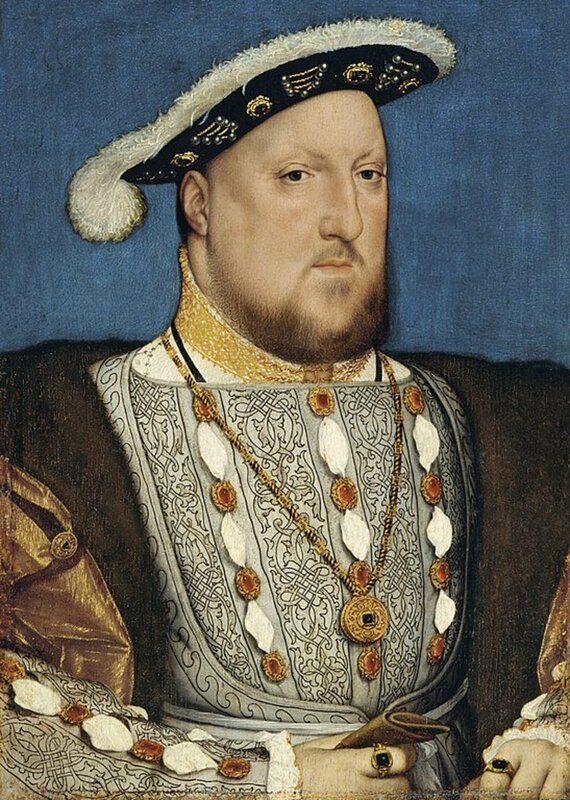 Yes, I saw in a documentary that some of his turn about occurred when he transitioned to the English throne. London was more metropolitan and scientific thinking was growing there, so belief in witchcraft was seen as backwards and primitive. James is a fascinating figure with a lot of interesting terrain to cover! Now that the media (especially television and film) have thoroughly explored the Tudors inside and out, maybe it's time to move on to the Stuarts! Great article Carolyn- thoroughly enjoyed it! Later in James' reign, the tide began to turn against such indiscriminate treatment of witches and he was anxious to be seen as an enlightened monarch. He did famously intervene personally in the case of Anne Gunter a 14 year old from Windsor who claimed she had been bewitched. Anne displayed all the classic symptoms of bewitchment which was done under pressure from her father who was trying to seek revenge on an old crone he had fallen out with. To his credit, James had the girl examined and concluded it was all a hoax and dismissed the petition- - better late than never I suppose! This is very interesting as well as very educational. Thank you for an informative and thought provoking article! Excellent as usual. What does King James say about witchcraft in Daemonologie? 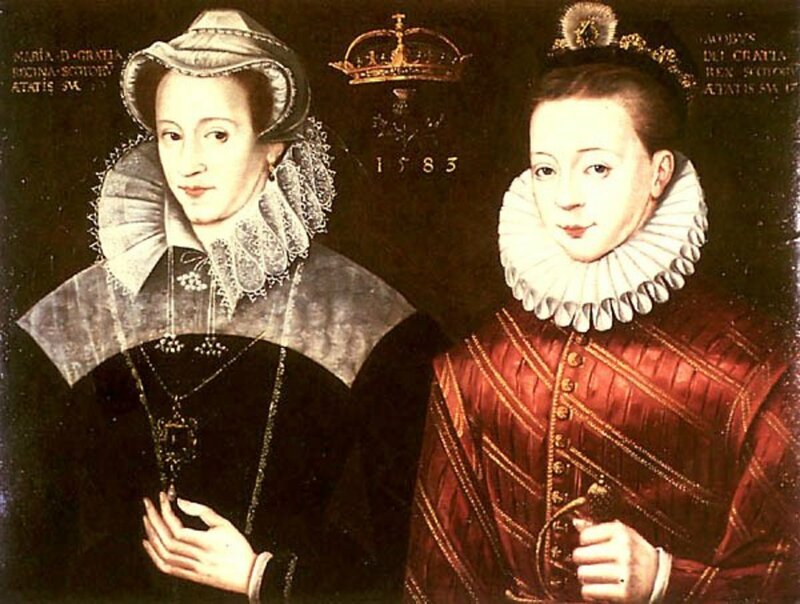 Also, why did Mary Queen of Scots think that Elizabeth I, herself a leading champion of Protestantism, would help her regain the Scottish throne? Truly fascinating read! I learned a lot, thanks. 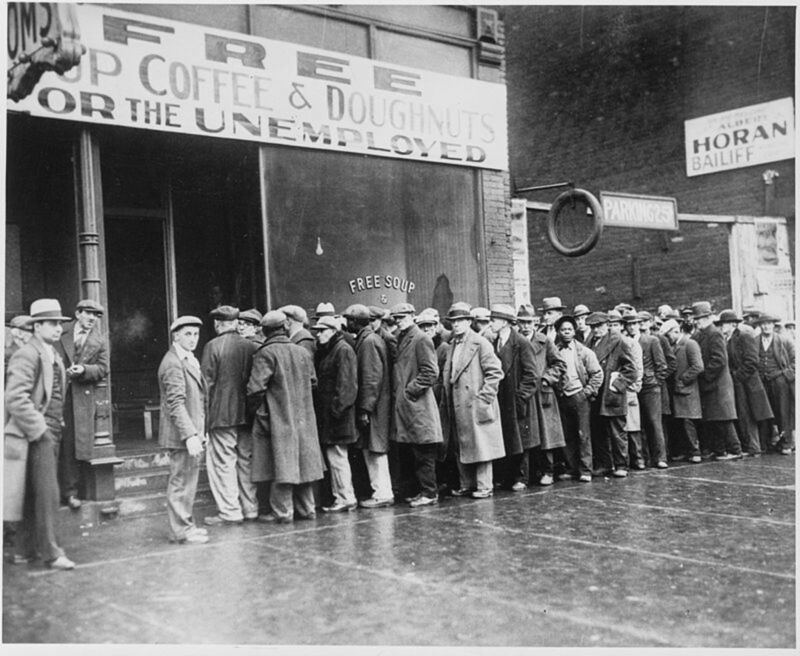 I think it is is interesting that the people who supposedly had gained so much 'power' from Satan were usually among the poorest and most powerless in society. This is a very interesting read. Voted up and shared. I was surprised when I learned that King James wrote Daemonlogie. Another horrible excuse to kill innocent people.